Jo has created a number of installations over the past few years. Most of this work has an environmental and social aspect, often exploring responses to climate change. Recent installations have taken on a more playful feeling. 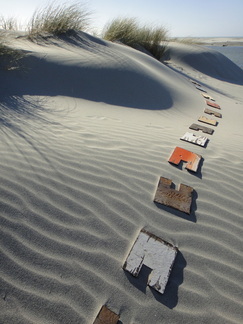 While spending 5 days on Farewell Spit Jo had fun exploring the old adage: "Necessity is the mother of all invention". Click on the titles below to view the work.